We are leading Suppliers of all types of pallets such as Plastic Pallets, Euro Pallets, Moulded Pallets and many more items from India. Our pallets are made from high quality raw materials and are robust with long lives. We use fresh materials for our pallets to ensure optimum strength. We have over 30 years of experience in supplying customized material handling equipments. Our ISO 9001:2008 systems certified facility is located in Noida (Delhi NCR). 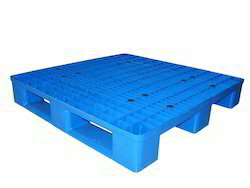 Our Plastic Pallets are high quality and durable. 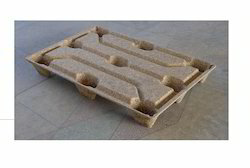 We offer pallets in virgin HDPE recycled plastic manufactured under strict control procedures. Our plastic pallets have been extensively field tested and have been in efficient service for a number of years. We supply high quality pres wood pallets that are a great low cost alternative to conventional wood plastic pallets. These pallets have the same functionality as equivalent sized plastic pallets and can withstand handling with forklift. 60% lighter than traditional hardwood pallets. Nestable - Saves valuable storage space. No nails or screws to ensure products and handling personnel safety. Made out of 100% recyclable wood fibre or wood waste. Alternative to conventional wooden and plywood pallets and expensive plastic pallets.